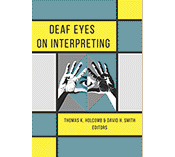 This is the fourteenth weekly installment featuring highlights from the 20 chapters in the new book, Deaf Eyes on Interpreting, edited by Thomas K. Holcomb and David H. Smith which was released in June by Gallaudet University Press. Fallon Brizendine is a Deaf professional working to educate future interpreters. She expands on concerns raised by Amy June Rowley in our last blog post regarding placing novice interpreters in the pivotal role of working with Deaf children in mainstreamed schools. Whether they like it or not, without a critical mass of Deaf language models in their lives, the Deaf students will look to their interpreters as language models. This places a heavy responsibility on them. However, Brizendine has some concrete ideas to remedy this situation. 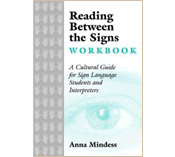 She suggests that interpreters be ready to take on this important role by visiting bilingual ASL/English classrooms and observing the bilingual teachers to see the manner in which they deliver lessons and interact with their students in ASL. She also puts responsibility on Deaf professionals who work in the educational field, such as herself, to connect with educational interpreters and offer them feedback and support. 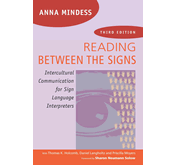 Posted in ASL, Deaf Education, Deaf Eyes on Interpreting, Deaf Professionals, Educational interpreting, interpreters, Mainstreamed settings, New book, Deaf Eyes on Interpreting and tagged Deaf Education, Deaf Eyes on Interpreting, Educational Interpreters, Fallon Brizendine, Mainstreamed settings. Bookmark the permalink. 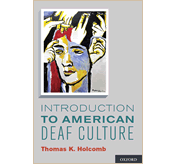 This is the thirteenth weekly installment featuring highlights from the 20 chapters in the new book,Deaf Eyes on Interpreting edited by Thomas K. Holcomb and David H. Smith which was released in June by Gallaudet University Press. In her chapter, Amy June Rowley explains why she refuses to subject her own Deaf children to interpreter-mediated education, based on her own personal experiences growing up in mainstreamed programs. In addition, she cites studies showing how Deaf students are being serviced by poorly qualified interpreters in many mainstreamed programs. Rowley emphasizes several points: young Deaf students in mainstreamed settings are often isolated without full access to language, culture and social opportunities. Interpreters may be the only persons with knowledge of Deaf culture and ASL, yet many interpreters do not have a clear understanding of the scope of their roles. In fact, Interpreter Training Programs often put their students in educational settings as internships, giving the message that this is an appropriate place in which to start their careers. Rowley disagrees and sees it as a place for experienced interpreters with many years of experience. She recommends interpreters partner with members of the Deaf Community and educators of Deaf children to give Deaf children the best, most supported start. Posted in ASL, Deaf Education, Deaf Eyes on Interpreting, Educational interpreting, Families with deaf children, interpreters, Mainstreamed settings, New book, Deaf Eyes on Interpreting and tagged Amy June Rowley, Deaf Education, Deaf Eyes on Interpreting, Educational Interpreters, Mainstreamed settings. Bookmark the permalink.